I forgot to attach the picture. It works properly. Nice all original machine with no problems. The Rol A Top is sold. Do have to wonder though, why would an original dime machine have a cabinet with a coin entry hole that is so large? Wouldn't that cause a problem by allowing someone in the Legion hall to inadvertently just put a nickel (or even a penny) into the machine? Since the mech is sized for a dime the larger coin would just get stranded in the top head. Seems like a recipe for upset patrons to have a machine getting jammed up all the time. Also seems a bit odd to have a machine with a post-war serial number and club handle have a mech that pays on 2 cherries and have tin reel strips. CoinOpNut wrote: Congrats on the sale! 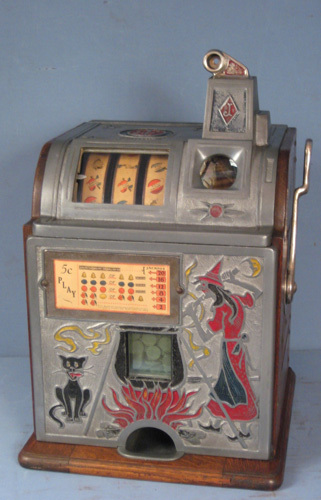 I am guessing that at some point in time the mechanism from an early dime machine (as indicated by the tin strips and blue badge) and the top casting from a $.25 machine were used. Dime machines from this serial number era should have a brass denomination badge.